At the invitation of the government of the United States, President Xi Jinping's Special Envoy, Member of the Political Bureau of the Central Committee of the Communist Party of China (CPC), Vice Premier of the State Council and Chinese Initiator of the China-US Comprehensive Economic Dialogue Liu He will pay a visit to the United States from May 15 to 19. Vice Premier Liu He will hold another round of consultations with the US economic team led by US Treasury Secretary Steve Mnuchin on bilateral economic and trade issues. Q: It is reported that a high-level DPRK official has arrived in Beijing today. Do you know who this high-level official is? What is the purpose of the visit? Is it to brief the Chinese side on their talks with US Secretary of State Mike Pompeo? A: China and the DPRK maintain normal exchanges. As for the reports you just mentioned about the arrival of a senior DPRK official, I am not aware of that situation. Q: Yesterday, US President Donald Trump tweeted that he and President Xi Jinping are working together to give massive Chinese phone company, ZTE, a way to get back into business fast and that the US Commerce Department has been instructed to get it done. What is your response to this? 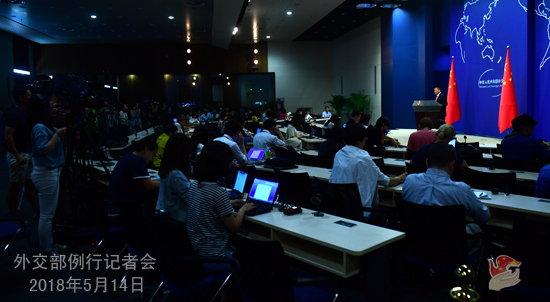 A: We highly appreciate these positive remarks on the ZTE issue, and we are currently in close communication with them on how exactly to implement it. As for the specific issues over which the US side has voiced its concerns, our two sides also maintain close communication. Like I said just now, at the invitation of the US government, Vice Premier Liu He will travel to the US from May 15 to 19 for more consultations with the US economic team on bilateral economic and trade issues. China is willing to work with the US to ensure positive and constructive outcomes from this upcoming round of trade talks. Q: On May 12, clashes broke out between the Myanmar government forces and ethnic armed groups in the northern Shan State, close to the China-Myanmar border area. There were some casualties, and according to the Chinese Embassy in Myanmar, besides these casualties on the Myanmar side, the conflict also drove border residents and flew stray bullets into the Chinese side. China has lodged stern representations with the relevant parties in Myanmar. Can you give us more details and what is China's position on this? A: China is highly concerned about the military conflict in northern Myanmar on May 12. According to our information, the conflict has killed two Chinese nationals in Myanmar, and three rocket grenades and some stray bullets have fallen into the Chinese territory. In addition, over 300 Myanmar citizens living in the border area have fled to China to escape the conflict. Out of humanitarian spirit, the Chinese side has taken necessary measures and provided sheltering to these people. Recently, there have been continued and escalating military frictions in northern Myanmar, including this latest one which has caused severe casualties and undermined stability in the China-Myanmar border area. It runs counter to the efforts made by relevant parties in Myanmar to hold the third meeting of the Panglong Peace Conference and seek national reconciliation and peace as well as the consensus to safeguard peace and tranquility of the border area. Just like what you said in your question, China has lodged stern representations with relevant parties in Myanmar. We ask all conflicting parties to immediately cease fire and take every possible measure to avoid an escalation of the situation, return peace and tranquility at an early date to the China-Myanmar border area, and never allow such incident which threatens peace and stability in the China-Myanmar border area to happen again. The principle of promoting the peace process through dialogue and consultation with comprehensive and inclusive policies needs to be observed by all parties in Myanmar. It also represents the only viable way for Myanmar to realize reconciliation and peace. We urge relevant parties in Myanmar to abide by this principle, seek to work towards the same direction through dialogues, properly handle differences, build mutual trust, and endeavor to move forward the peace process. Q: You said that you are not aware of the specifics regarding a senior DPRK official's visit. Can you confirm that one senior DPRK official has arrived in Beijing today? A: Just like what I said in my previous answer, I am not aware of the situation. 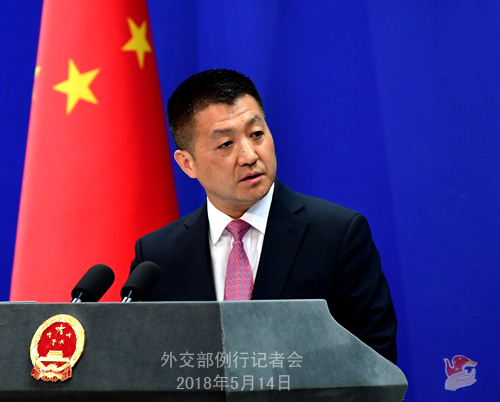 Q: On May 12, the DPRK Foreign Ministry announced that the DPRK side would dismantle its Punggye-ri nuclear test ground between May 23 and 25 in light of weather conditions and would allow journalists from China, Russia, the US, the UK and the ROK to witness the closure of the site. Do you have any comments? A: This announcement by the DPRK Foreign Ministry has caught the attention of the international community. We believe that this announcement, which is conducive to the political settlement of the Peninsula issue, demonstrates the DPRK's goodwill in promoting a denuclearized Peninsula and establishing mutual trust with relevant parties. It should be welcomed, encouraged and supported by the international community. Q: According to reports, on May 13, suicide terrorist attacks hit three churches in Surabaya, which is located in the province of East Java of Indonesia, killing at least 13 people and injuring 43 others. On May 14, the police station of Surabaya was also struck by suicide bombings. What is your comment? A: China strongly condemns these terrorist attacks in Surabaya, Indonesia. We mourn for the innocent victims and express condolences to the injured and the bereaved families. China is opposed to all forms of terrorism. We stand ready to step up cooperation with the Indonesian side and other members of the international community to jointly counter terrorist threats and challenges and uphold peace and tranquility of the region and the world. Q: China's Three Gorges Corporation is offering 9.1 billion euros to buy remaining stocks in the Portuguese utility firm EDP. Do you expect a pushback from European regulators on this purchase? Are you concerned about any possible pushback? A: I also learnt about this case from the media reports. We are not aware of the details and would refer you to the relevant department. China and Portugal enjoy friendly ties. The two countries have achieved fruitful outcomes in all-around practical cooperation. Such cooperation, which is two-way and mutually beneficial, has brought tangible benefits to the two countries and the two peoples. The Chinese government supports and encourages Chinese companies in carrying out mutually beneficial cooperation with the Portuguese companies and hopes that the two sides could work together to achieve win-win results on a larger scale. When the cooperation undertaken by the two sides is based on mutual respect, mutual benefit and win-win outcomes and delivers concrete benefits to the two sides, I see no reason why other parties would object to that. Q: Is there any update on the health of the Chinese national who was injured in the Paris knife attack over the weekend? A: According to the latest information, this Chinese citizen sustained minor injuries and is not in a life-threatening condition. Since you mentioned this incident, I want to talk about China's position on it. China condemns this attack in Paris, France. We mourn for the innocent victims and express sincere condolences to the injured and the bereaved families. Since you mentioned about the Chinese citizen injured in this attack, I would like to take this opportunity to thank the French government for the assistance it offered to our people. China is firmly opposed to all forms of terrorism. We stand ready to work with France and the rest of the international community to enhance counter-terrorism cooperation. Q: US Secretary of State Mike Pompeo said in an interview on May 13 that if the DPRK takes necessary steps to ensure that the US is no longer held at risk by its nuclear weapons arsenal, then the US will ensure that the DPRK people have the opportunity for greatness. When asked whether the DPRK Supreme Leader could stay on in power, Secretary of State Pompeo said that the US will have to provide security assurances to be sure. Do you have any comments? A: We have noted these remarks made by Secretary of State Pompeo on giving the DPRK security guarantees, and we think of them positively. 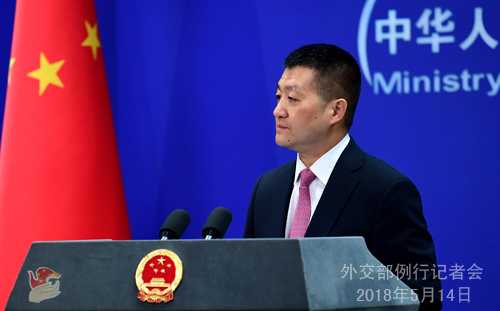 China maintains that all parties shall engage in dialogue to move forward the political settlement of the Korean Peninsula issue and address their legitimate concerns in a balanced way. In particular, the legitimate security concerns of the DPRK side need to be addressed for while pushing forward the Peninsula denuclearization. That is conducive to the collective efforts to forge enduring peace and stability on the Korean Peninsula and in the region. I believe all of you have noticed the encouraging development that under the concerted efforts of all relevant parties, the momentum for dialogue and détente has been further consolidated, and more steps are being made towards the political settlement of the Korean Peninsula issue. China encourages all relevant parties to work towards the same direction, say more words to show goodwill and alleviate tension, and do more things to promote dialogue and enhance mutual trust. Due to scheduling reasons, tomorrow's regular press conference (Tuesday, May 15) will start at 2 p.m. at the same venue.